This is our custom-built TRS 1/4" to Two XLRs (one Male, one Female) insert cable. Construction is Neutrik TRS & XLR connectors with Mogami 2319 cable. Neutrik connectors are some of the best connectors around. Mogami wire is (as far as I'm concerned) the best wire, used in the best studios for its ultimate sound qualities and durability. Mogami 2319 cable is very flexible, durable, light-weight cable. 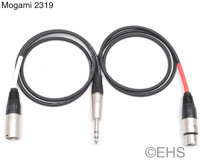 Cable is constructed as a "Y" for Insert Send-Return, wired TRS out to two XLR connectors, the first shrink labeled white with XLR male and wired to the Tip for insert send, the second shrink labeled red with XLR female and wired to the Ring for insert return.